I figure the best way I can be of service to those of you who want to help pit bull terriers is to bring you fresh, relevant material that adresses your needs, questions and concerns. Of course, I could guess about what your needs might be. But, why not just let you tell me what you want? What follows is a very brief survey. Just a few questions that will probably take less than 5 minutes to answer. And, it will help me bring you more of what you want from The Proper Pit Bull website and Bully For You! ezine. 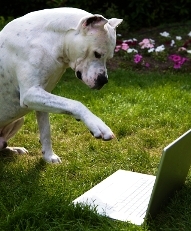 Note: If you have a pressing concern to which you'd like a personal reply, please use our Pit Bull Community Q & A page. What is the most important question you have or the most difficult challenge you face related to owning, adopting or caring for a pit bull? How difficult has it been for you to find information or help with the above issue? Aside from your most important concern above, what other topics would you like to read about in Bully For You! ezine or on The Proper Pit Bull website? Any comments or suggestions you'd like to add? If I have a question about one of your responses, may I contact you for clarification? If you answered yes, please supply your contact info below.